Gelatin (softgel), glycerin, purified water and aqueous coating (modified cellulose, fractionated coconut oil [non-hydrogenated], sodium alginate, stearic acid. Take 1 softgel up to 3 times daily with water. 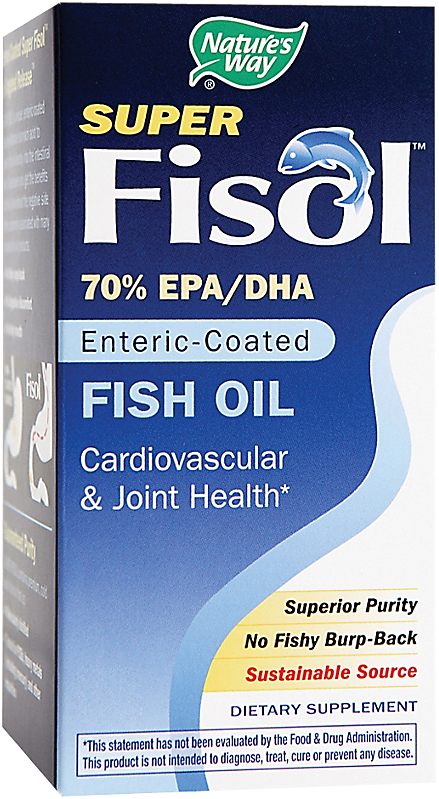 Because Super Fisol is enteric-coated and better absorbed by the body, its required dose is less than taking non-coated fish oil. Gelatin (softgel), glycerin, purified water, aqueous coating (modified cellulose, fractionated coconut oil [non-hydrogenated], sodium alginate, stearic acid), soybean oil. Recommendation: Take 1 softgel up to 3 times daily with water. Nature's Way Super Fisol is a just what a lot of fish oil users have been looking for. Super Fisol contains a fish oil concentrate that contains a minimum of 70% omega-3 fatty acids, among the highest in the industry, so you don't have to take as much to get your daily 1000 mg minimum of DHA/EPA. Super Fisol also has an enteric coat, a great feature that protects you from that fishy-tasting burp-back or aftertaste. And the 500 mg Super Fisol softgels are much smaller than the typically huge 1000-1200 mg fish oil softgels, so these are easier-to-take for a lot of people. There's a small amount of vitamin E added to help protect Super Fisol from oxidation. 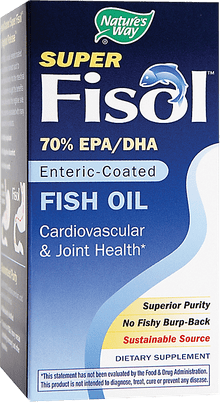 This combination of features and affordability make Super Fisol one of the very best choices from among the hundreds of fish oil products on the market. SUPER FISOL supports ocean ecosystems by using sustainable source fish from Alaskan waters.